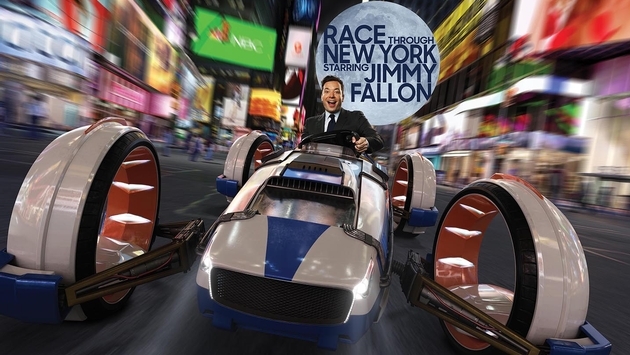 Jimmy Fallon’s Race Through New York will open on April 6. The all new attraction is half Tonight Show museum, half ride. As you enter a replica of the Tonight Show Studio, you’ll see the New York Skyline on the outside of the building. On the inside, you’ll get to walk through history as you see props from former Tonight Show hosts, including Jimmy Fallon, Jay Leno and Johnny Carson. You’ll get to write “Thank You” letters to your friends and family at Jimmy’s desk, and you’ll see the Roots perform. The wait to get on the ride is part of the fun, as Universal Orlando will create a completely immersive experience that gets you ready for the journey you’ll take next. Don’t worry about being in a long line and having to rush along though, because Universal is making Jimmy Fallon their first “wait-less” ride. The ride will have a virtual queue system, which means that you reserve a time for the ride, then go around the park doing other stuff. You simply book your time using the Universal app once you’re in the park, or you go to a kiosk at the ride to book your time. Once you get your time, you simply go enjoy the rest of the park. Within a few minutes of your ride time, you simply walk up to the ride and enjoy! The new system is something that Universal has been testing with various attractions, such as Shrek and Pteradon Flyers. It’s also going to be a major component of Volcano Bay, which opens later this summer. That entire park will operate on the virtual queue system they are calling “Tapu Tapu.” That system will incorporate a new bracelet-style device that you’ll wear. It seems like Universal is fully investing into the system, and we can probably expect to see it replace many of the huge waits at attractions in the future. As for Race Through New York, guests will begin the experience by boarding a “Flying Theater” ride. The new system is a first for the United States and will have you soaring through the air, and the streets of New York in an all new 3D environment. You’ll put on 3D glasses and experience the sights, sounds and smells of New York as you compete against Jimmy Fallon in this all new attraction. To celebrate, Jimmy Fallon is broadcasting the Tonight Show LIVE from Universal Orlando. We know how Jimmy travels, as the last time he brought tons of celebrities and performers with him, so we’re sure that this is going to be one amazing night! The all new ride opens April 6 at Universal Orlando and we simply cannot wait!